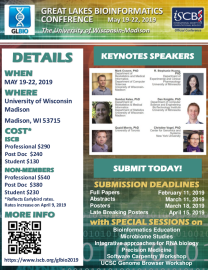 April 13, 2019 - GLBIO 2019: Call for Late Breaking Poster Submissions! 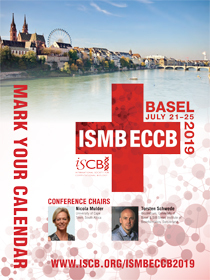 April 11, 2019: ISMB/ECCB 2019: Today is the day - Submit your research! Early Bird Reg Deadline June 7! The countdown has begun... 3 Days left to SAVE - Early Bird Registration Deadline is June 7! 25 years of human gene finding: are we there yet? How Does Protein Disorder Enable Phenotypic Diversity? The ISMB 2018 conference has been designed to make it easy for researchers sharing common interests to come together and listen to exciting new developments in their field. At the heart of the meeting are seventeen established communities (COSIs – Communities of Special Interest) reflecting most of the major research themes and training in computational biology. ISMB welcomes abstract submissions to all of these communities as well as general bioinformatics. The 2018 featured ISMB COSIs are listed below. To learn more about each community, click on the COSI logo. biological systems without understanding the 3D structure of their constituting parts and their interactions. 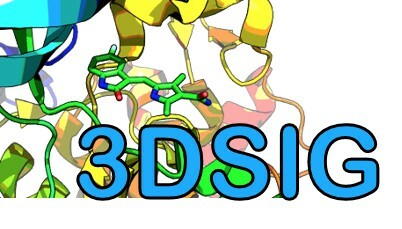 3Dsig focuses on structural bioinformatics and computational biophysics and has become the largest meeting in this growing field. The large, complex data sets for the Critical Assessment of Massive Data Analysis (CAMDA) contest include built-in truths for calibration. In an open-ended competition, however, both seasoned researchers and cunning students push the boundaries of our field, with unexpected questions or angles of approach often bringing the most impressive advances. Evolution and comparative genomics are deeply intertwined with computational biology. Computational evolutionary methods, such as phylogenetic inference methods or multiple sequence alignment are widely used, yet remain far from “solved” and are indeed intense areas of research. The MICROBIOME Community of Special Interest aims at the advancement and evaluation of computational methods in microbiome research, especially metaomic approaches. Based on the Critical Assessment of Metagenome Interpretation (CAMI), the COSI supplies users and developers with exhaustive quantitative data about the performance of methods in relevant scenarios. RNA track covers the full range of research topics in the field of RNA Biology, from computational and high-throughput experimental methods development to their application in different aspects of RNA processing, structure, and function in both normal and disease conditions. VarI-COSI track discusses the recent advances in the methodology for the annotation and analysis of genetic variants. The VarI-COSI meeting is dedicated to the recent advances in the analysis and interpretation of the genetic variants. Bio-Ontologies Community of Special Interest Group (COSI) covers the latest and most innovative research in the application of ontologies and more generally the organisation, presentation and dissemination of knowledge in biomedicine and the life sciences. COSI CompMS promotes the efficient, high-quality analysis of mass spectrometry data through dissemination and training in existing approaches and coordination of new, innovative approaches. 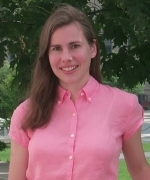 The mission of the Function Community of Special Interest (Function-COSI) is to bring together computational biologists, experimental biologists, biocurators, and others who are dealing with the important problem of gene and gene product function prediction, to share ideas and create collaborations. 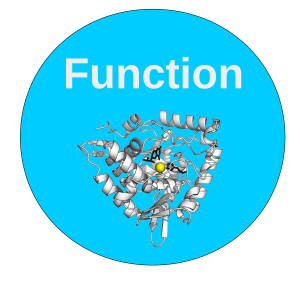 The Function COSI features the Critical Assessment of Function Annotation, an ongoing community challenge aimed at improving methods for protein function prediction. Systems Biology and Machine Learning meet in the MLCSB COSI. The community is the place for researchers of these areas to exchange ideas, interact and collaborate. As large scale, systems-level data are becoming increasingly available, modeling and analyzing them as networks is widespread. Network Biology Community serves to introduce novel methods and tools, identify best practices and highlight the latest research in the growing and interdisciplinary field of network biology. 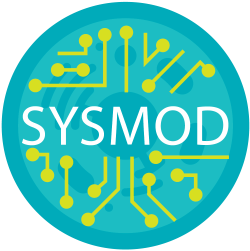 The Computational Modeling of Biological Systems (SysMod) aims to create a forum for systems modelers and bioinformaticians to discuss common research questions and methods. 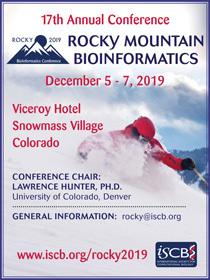 The session will focus on the conjoint use of mathematical modeling and bioinformatics to understand biological systems functions and dysfunctions. many COSI leaders and track chairs who keep these communities vibrant and engaging. The BioVis track aims to educate, inspire, and engage bioinformatics and biology researchers in state-of-the-art visualization research and visualization researchers in problems in biological data visualization. 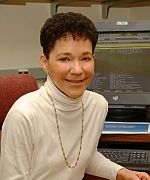 Education-COSI focuses on bioinformatics and computational biology education and training across the life sciences with a goal to foster a mutually supportive, collaborative community in which bioscientists can share bioinformatics education and training resources and experiences, and facilitate the development of education programs, courses, curricula, etc., and teaching tools and methods. HiTSeq is a community of special interest devoted to the latest advances in computational techniques for the analysis of high-throughput sequencing (HTS) data. Sessions will be devoted to discussing the latest advances in computational techniques for the analysis of high-throughput sequencing (HTS) datasets and will provide a forum for in-depth presentations of the methods and discussions among the academic and industry scientists working in this field. Regulatory genomics involves the study of the genomic control system, which determines how, when and where to activate the blueprint encoded in the genome. Regulatory genomics is the topic of much research activity worldwide. Since computational methods are important in the study of gene regulation, the RegSys COSI meeting focuses on bioinformatics for regulatory genomics. 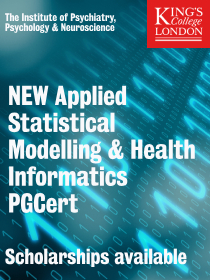 TransMed covers the current developments in the field of clinical and translational medicine informatics. Analysis of large amounts of multi-omics, imaging (medical and molecular), mobile sensor, clinical and health records data is paving the way for precision medicine. In the TransMed track, we will explore the current status of computational biology and advance machine learning approaches within the field of clinical and translational medicine. Early Registration Deadline Approaching - June 7! Numerous Reasons - Don't miss out on the premier bioinformatics conference of the year! Connect – Meet and Collaborate with over 1,600 scientists representing more than 50 countries from computer science, molecular biology, mathematics, statistics and related fields. Professional Development – NEW THIS YEAR ISMB Career Fair! Host a table, post a job, find the talent to propel your organization. As your selected professional society of choice, it’s important for ISCB to ensure we are meeting your needs as a member. Please take a moment to fill out our member satisfaction survey. It should take approximately 6-10 minutes to complete. ISCB is your Society. Help us make ISCB what you want and need! Upcoming Conferences -- Mark Your Calendars! From 11-13 July 2018, the NCBI will help out with a Data Science hackathon on the Northwestern School of Medicine Campus in Downtown Chicago! The hackathon will focus on genomics as well as general Data Science analyses including text, image and sequence processing. This event is for researchers, including students and postdocs, who have already engaged in the use of large datasets or in the development of pipelines for analyses from high-throughput experiments. Some projects are available to other non-scientific developers, mathematicians, or librarians. Planning on attending ISMB 2018 in Chicago? Register today before the early bird registration deadline and SAVE! Read through the program preview! Join us in Chicago to connect, engage, and inspire! Recruit - Engage - Inform! Did you know the ISMB exhibit hall is more than just a place to learn and discover new products and services? It is also a place to promote your university's degree programs or open positions within research laboratories! This call is an open invitation to scientists and professionals working in the fields of bioinformatics and computational biology to submit high quality proposals for tutorials, workshops or mini-courses (tutorial program) at the ISCB-Latin America, SoIBio and EMBnet Joint Bioinformatics Conference 2018 (ISCB-LA SoIBio EMBnet). Submit your research today! Enrollment for the National Institutes of Health’s All of Us Research Program is officially open! The All of Us Research Program is a momentous effort to advance individualized prevention, treatment and care for people of all backgrounds. The program’s goal is to enroll 1 million or more volunteers, and oversample communities that have been underrepresented in research to make the program the largest, most diverse resource of its kind. Call for nominations for Treasurer and Vice President. Only members can nominate; self-nominations are not allowed. Calling Principal Investigators to Host Internships! The ISCB Student Council (ISCB-SC) is currently soliciting principal investigators (PIs) to host internships through the SC’s Internships Program. The program connects students in developing nations with PIs in developed countries to gain hands-on short-term research experience. These internships benefit the intern as well as the host lab both scientifically but also culturally. The program launched in 2009 and is committed to providing computational biology training for students from developing nations and improving competencies in the field. If you’re interested in hosting an internship or would like to know more about the internships program you can read our recently published article in PLOS Computational Biology , visit internships.iscbsc.org. The ISCB Art in Science Competition is a way to show the beauty of science in art form. ISCB invites submission to the 2018 ISCB Art in Science competition. All interested members (hereafter referred to as "artists") may submit images that have been generated as part of a research project and other creative efforts that involve scientific concepts or employ scientific tools and methods. Learn more at www.iscb.org/iscb-art-in-science-competition. 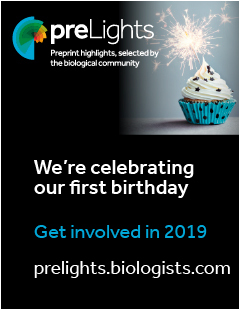 We are too but very excited for GLBIO 2019 in Madison. In the meantime, take a look at the GLBio PLOS ONE Collection (http://collections.plos.org/s/glbio) and we look forward to seeing you at ISMB 2018 in Chicago! ISCB works closely with OUP Bioinformatics to reduce open access charges. ISCB is pleased to announce that OUP Bioinformatics will now offer a 15% discount on open access charges for all ISCB members. The discount will be applied after acceptance and requires author noting that he/she is an ISCB member. Not a member? Join today! All ISCB members interested in subscribing to print or online issues of traditional subscription-based journals receive a discount on subscriptions to the journals highlighted below. Student members are entitled to additional discounts, when available. To subscribe, log into My ISCB and select the Subscribe to Journal menu item located on the left-hand menu. Take advantage of this DISCOUNT and order your journal TODAY! The ISCB Career Center - Connecting you to your career! It is the place to post a job, search for a job, or upload your resume. Job posting and resume upload is complimentary for members. Nonmember may also participate for a nominal fee. Not yet a member of ISCB? Don't keep missing out on conference discounts, access to incredible science and so much more! Click here for all membership benefits and further details! AmazonSmile is a simple and automatic way for you to support ISCB every time you shop, at no cost to you. When you shop at smile.amazon.com, you’ll find the exact same low prices, vast selection and convenient shopping experience as Amazon.com, with the added bonus that Amazon will donate a portion of the purchase price to ISCB! ISMB 2018: FINAL Call for Technology Tracks! Deadline: TODAY! ISMB attracts top international scientists and key decision makers in the life sciences from the world’s largest and most prestigious research institutions and companies. Promote Your Innovative Tools, Methods, Service at ISMB 2018! 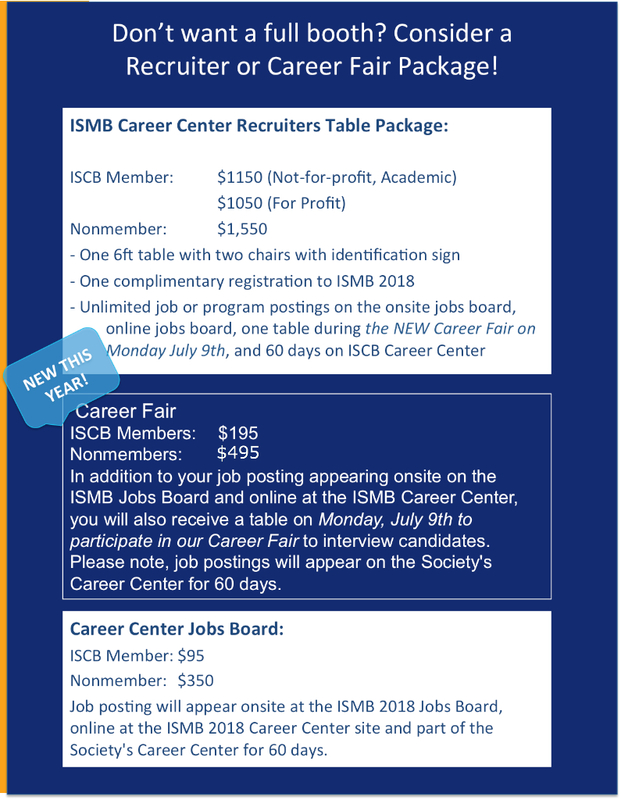 NEW THIS YEAR: ISMB 2018 Career Fair! In addition to job postings appearing onsite on the ISMB jobs board and online at the Career Center, you will also receive a table on Monday, July 9th to participate in the ISMB Career Fair to interview candidates from a pool of 900+ students & postdocs. As your selected professional society of choice, it’s important for ISCB to ensure we are meeting your needs as a member. Please take a moment to fill out our member satisfaction survey. It should take approximately 6-10 minutes to complete. ISCB is your Society. Help us make it what you want and need! The ISCB Art in Science Competition is a way to show the beauty of science in art form. ISCB invites submission to the 2018 ISCB Art in Science competition. All interested members (hereafter referred to as "artists") may submit images that have been generated as part of a research project and other creative efforts that involve scientific concepts or employ scientific tools and methods. Learn more at https://www.iscb.org/iscb-art-in-science-competition. Hot off the E-press: The Spring Newsletter! Just released - the Spring Newsletter is here. Read through the ISMB 2018 exciting program line-up, updates from within the scientific community, society updates and learn more about exciting new initiatives to come!. Attending ISMB 2018? Book your hotel today and save! 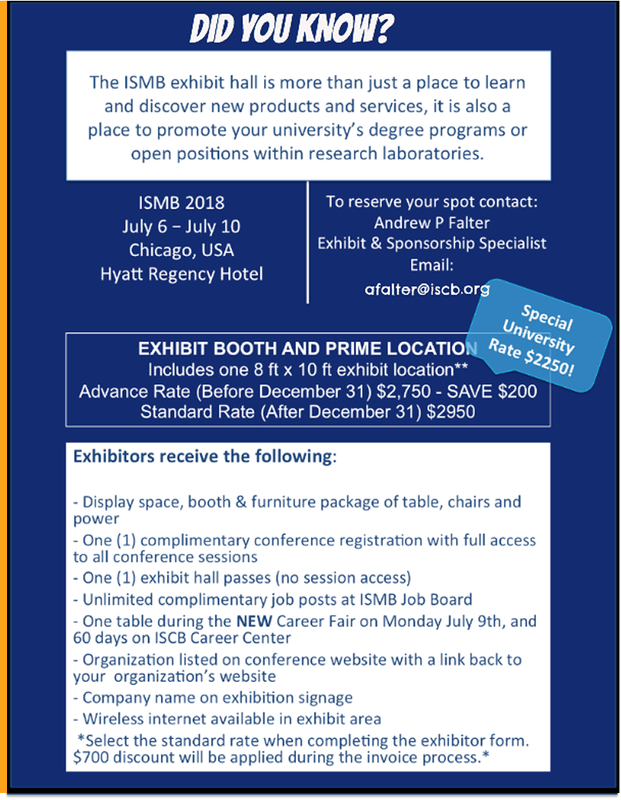 ISMB 2018 will be held at the Hyatt Regency Chicago and is the Headquarters Hotel. Attendees that book in the block receive complimentary Internet access and 40% off parking. Call for nominations for Treasurer and Vice President, and for Board of Directors. Student Council Leadership positions for Chair, Chair-elect, Treasurer, Secretary, and representative to the Board of Directors. ISCB is a member of FASEB. We kindly ask for your assistance in assessing our relationship with FASEB by completing this survey - https://goo.gl/Xy7QyR. The goal of this survey is to better understand how FASEB impacts ISCB members and what more FASEB could do for ISCB. Register Now for RECOMB2018 Workshop! Promote Your Innovative Tools, Methods, Service at ISMB 2018! Call for Tech Talks Closes May 10! largest and most prestigious research institutions and companies. Join us in Chicago to connect, engage, and inspire! 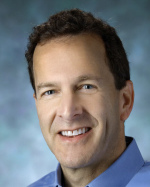 To capitalize on the opportunities presented by advances in data science, the National Institutes of Health (NIH) is developing a Strategic Plan for Data Science. This plan describes NIH's overarching goals, strategic objectives, and implementation tactics for promoting the modernization of the NIH-funded biomedical data science ecosystem. As part of the planning process, NIH has published a draft of the strategic plan today, along with a Request for Information (RFI) to seek input from stakeholders, including members of the scientific community, academic institutions, the private sector, health professionals, professional societies, advocacy groups, patient communities, as well as other interested members of the public. ISCB's Public Affairs and Policy Committee submitted a response to the drafted strategic plan on behalf of ISCB. The Committee found that the plan provides a framework to deal with data science challenges and recognizes the importance of data sciences to the overall success in meeting the NIH mission. Continuing the emphasis areas of Big Data to Knowledge (BD2K) initiative, it is highly positive that the Plan recognizes data standards, interoperability, infrastructure, and training as critical focus areas. In addition, the goals of defining different and appropriate funding mechanisms and reviewing criteria for data-science efforts will resolve some major impediments within the current NIH funding ecosystem. 3) a limited representation of the challenges of data use globally. Considering that databases, information portals, knowledge bases, and tool developers represent a significant portion of a highly heterogeneous scientific data ecosystem, imposing binary funding distinctions may lead to dysfunctional or simply unworkable solutions. The conclusion (or view) of the ISCB is that the Proposed Strategic Plan is a much needed step in the right direction, but that before long term funding policy decisions are made, there is a need for strong community input and buy-in to expand on the specifics and possible unforeseen consequences of vague definitions and distinctions as discussed in the changes suggested below. We recognize that the distinction between "databases" and "knowledgebases" is stressed in the Strategic Plan as a way of differentiating funding mechanisms. However, the wide variety of information portals renders such a binary distinction highly artificial. The Strategic Plan states that a DB makes available the "core data" (no definition is offered) of some biological system, whereas a KB organizes information "related to core datasets," and states that KBs typically require significant curation whereas DBs do not. Model organism DBs (MODs) are cited as an example of DBs, yet MODs have undergone hundreds of person-years of curation efforts – an apparent contradiction. MODs are Knowledgebases. Perhaps the confusion is between 'data stores' where data are not curated and there is minimal metadata assignments, and 'knowledgebases' where many relevant data stores are integrated and curated soas to facilitate the full use of the data for computational analysis. This notion that "core data" is the key differentiating feature is not widely accepted among practitioners in the field and is quite vague. For example, the transcriptome is listed as core data (belonging to DBs), whereas an expression pattern is listed as belonging to KBs. But no clear separation into core versus related-to-core data is obvious in the following list of datatypes present in one well-known biological data/knowledge-base: genes, promoters, transcription factor binding sites, terminators, operons, metabolites, enzymatic reactions, transport reactions, metabolic pathways, gene essentiality data. Since the Strategic Plan now seems to advocate that no efforts should be funded that combine both core data and non-core data, presumably the preceding data/knowledge-base project (and most MODs as well) must be divided into two separate projects. Such an element of the Plan would create a major obstacle for the information integration that is so valued by end users. In reality, a continuum exists between DBs and KBs, and attempts to find a reliable place on that continuum to define a funding policy would prove challenging and troublesome and may have to be abandoned. We see the proposal to "Separate support for tools development from support for databases and knowledgebases" as quite problematic because in practice the developments of many tools (software) and DBs/KBs are tightly intertwined and their separation may be both impossible and ill advised. Often, tools developed independently from the participation of the DB/KB community fail to actively incorporate data and data updates and fall into dis-use. 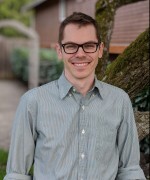 For example, if a grant application is designed to develop the first DB for metabolomics data, it would be critical for this effort to develop software for parsing submitted data, validating submitted data, enabling curators to add and modify descriptions of the experimental conditions, storing submitted data to a database management system, and for powering a user website that allowed users to submit queries and view query results. Without such software, the DB could not be populated, checked for accuracy, nor made available to users. Without the software, there is no database! It is not clear whether the Strategic Plan mean s to imply that every DB/KB project must involve two grant applications, one for the software and one for the DB/KB, but we do not consider this to be an advisable process. Another problem with this idea is the apparent underlying assumption that any third party can easily write software tools for a given database. This is not the case because e very database has a schema – a precise computer definition of each type of data stored in the database (e.g., genes, proteins, metabolites) , and t he schema for a given database will change over time. Each software tool written for a given database must manipulate the data using exactly the same schema as the database currently uses, otherwise the database and the software will be incompatible. (1) The assumption seems to be that DB/KB applicants frequently include poor quality tool development tasks in their proposals. It is likely that in most of the proposals the inclusion of high quality tool development tasks leads to high (better) scores because the proposed tasks are excellent. Do data exist regarding the frequency of high versus low-quality tool components in DB/KB applications? (2) If NIH develops improved review criteria for DB/KB applications that decrease the weighting and/or necessity of innovation, both grantees and reviewers will need to put less emphasis on innovation, which should largely solve the problem. (3) Particularly for large projects, reviewers should be encouraged to recommend excising project elements that they consider poor quality, to enable awarding of high scores to the remaining project elements. Imagine a DB application with an excellent operational plan but a weak plan for developing an innovative software tool. Everyone is served by continuing funding for the DB as a whole but not funding the software tool: users enjoy continued operation of the DB; the project retains highly skilled staff members. The grantees should be given an opportunity to resubmit the component for the software tool for later funding consideration. But: excision of project components must be performed judiciously. CALL FOR TUTORIALS, WORKSHOPS, AND MINI-COURSES! The tutorial program provides participants with lectures and instruction covering either basic training for bioinformatics, well-established technologies/analyses or new "cutting-edge" topics relevant to bioinformatics and computational biology. April 11, 2018: Final Call for ISCB Officers and Board of Directors Nominations! April 04, 2018 - ISMB 2018: Present Your Research!